The picture I took to prove I was really there shows the last (hopefully) vestiges of snow on Mt. Rose, and at that juncture I point out that anywhere you see Mount Rose, Mount written out, is written by a person not from around here, for it’s Mt. Rose, everywhere but the elementary school, which for reasons unknown is Mount Rose School. Here we see the mountain with gentle fields of snow, scarred by the Hawken Fire of 2007. We’ll burn it down yet, I fear. If one looks closely at the photograph, it is evident that my buddy Gordon Zimmerman, that’s Dr. Gordon Zimmerman of the University of Nevada, retired, maybe even emeritus, is in the picture dead on a line with the camera and beyond the island in the lake. Now that island’s an interesting little piece of local real estate. 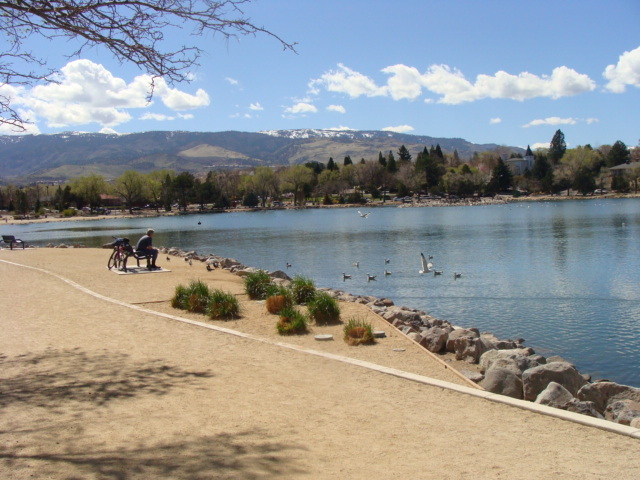 In my early years I was told by no less than Ed Pine, Sr., that the island on Virginia Lake, together with the migratory bird sanctuary on the south east corner of the lake, and the then-fish hatchery, now-off leash dog park on the south side of Mountain View Drive, were all federal properties, in ransom for the Department of Interior’s contribution to the CCC and WPA in construction of the lake. And I can also tell you that somebody should be ashamed of the condition of that island; at one time it was a focal point of the lake, and indeed the city. I’ve written about the house with the turret on the southwest corner of the lake – on Lakeside and Country Club Drive. That 6,000 square foot beauty was built by Luke Hancock, founder of Hancock Oil Company, one of the major oil companies in the nation in the pre-WWII years. He built it in the late 1930s, and it was completed in January of 1941, which coïncided with the “official,” by many accounts, completion of Virginia Lake. And while I’m boring you and myself with an English lesson, not that I slipped a diaerisis into coïncided above, which tells you that in those two consecutive vowels, the second one starts a new syllable. You won’t see it anywhere in modern usage except The New Yorker Magazine and Ol’ Reno Guy. Did anybody ever drown in Virginia Lake? Yes, they did, two Reno residents – one a teenager who drowned near the east shore of the lake just south of the Cochran Ditch outlet structure, ‘nuff said, and a lady, the wife of Ralph Festina, also known as Mrs. Festina, who was walking along the northeast corner of the lake and fell in – accounts vary as to whether she had a heart attack and fell in and drowned, or fell in and it triggered a heart attack, but in the final evaluation she gained the distinction of being the first person and only woman to drown in the lake, to go with an earlier distinction of being ½ the team in Reno who brought us “Pizza,” for the Festinas were chefs in the Colombo restaurant downtown and legend says they created pizza out of the leftovers of the food from the night before. Now – up Lakeside Drive we go, up being north to the house at 1900 Lakeside Drive. It was one of the earlier structures around the new lake, and was built with the express purpose of being a rural casino and tavern. The problem was, the citizenry didn’t want a casino and tavern in the proximity of their new civic jewel of a lake, so it never came to be. Nice try. While walking the lake which I do with some regularity, I’m always taken with the house on the northwest corner of Wildrose Drive and Lakeside Drive – it’s a Tudor of grand proportions. Now, after you’ve checked it out, look at the house at 2230 Watt Street. They were originally identical houses in 1951, the Watt Street house remaining as-built. Sid King built them, as he did many of the homes around the lake and the Watt Street, Sunset and Sunrise Drives, Country Club and Morningside – quite a builder. I lived in the Watt Street house, and watched the owner of the Lakeside Tudor re-engineer it for that steep pitched roof and virtual rebuilding. Just goes to show that money, in sufficient quantities, can do just about anything, not always with the intended consequences. This yarn is starting to grow to a ridiculous length so we’re now going to wrap it up and look at a few of the events and uses the lake and its park were put to. Not the least of which was an automobile race, sports cars, in 1952; out Lakeside Drive to Moana, west on Moana Lane to Plumas Street, (the “pits” were on Plumas, about by the present tennis courts) north on Plumas to Morningside, around the lake and back out Lakeside Drive was a lap. Cool. We had sailboat racing at Virginia Lake for a time, attorney Thomas Cooke, now deceased (and this is not my buddy Tom Cook, the attorney, Sigma Nu, raconteur, first-nighter, boulevardier, who is, or at least was alive ’til yesterday). Cooke organized the sailboat races. The Reno Municipal Band, “Tink” at the baton, performed every summer on Wednesday night at the Virginia Lake Park, ending each night’s show by leading the kiddies around the park to Stars & Stripes Forever. 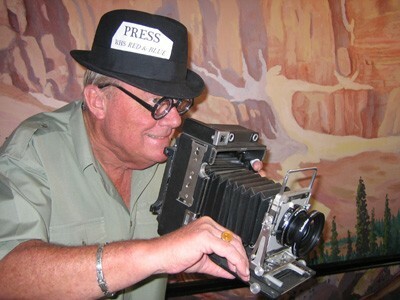 My compadre the late Glenn Little continued the tradition for many years thereafter. The muni band back then played Virginia Lake in July, and the University Quad in August. Or vice versa, depending on the whim, but in any case the parking was a lot better than when some genius decided to put the muni band downtown with no parking, signalling its near-demise. This piece is long enough. We’ll do it again. And we’ll run a full column about the sports car races, as soon as I find my pictures of the Jag XK-120s, Healeys, and MGs. And others, like the Army test-floating, or test-sinking, some amphibious Weasels in the lake. And the year the lake was drained. And the bounty-hunt for cormorants, a buck-a-beak – not a bad idea today. We’re not done yet.